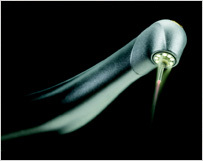 laser treatments | Melissa E. Rinck, D.D.S. In a world of changing technology, advancements in dental lasers allow us to offer laser treatments to improve the gum tissue health of our patients. Laser uses a concentrated beam of light and is relatively painless, yet so powerful it can kill harmful disease-causing microorganisms. We now know that laser has assisted periodontal treatments to help fight gum disease, reducing bleeding, swelling, inflammation, allowing faster healing. With an estimated 80% or more of adults diagnosed with gum disease to one degree or another be sure to get your laser treatments along with your regular dental cleanings!